Tears and Laughter in an Israeli Courtroom by Shneor Cheshin who was the Assistant Chief Justice of the Israeli Supreme Court. He was educated in Israel and at New York University, had many years of experience in the Mandatory Government and the Israeli court system. This book deals with people who for one reason or another find themselves face to face with judgment, why they have come before the bench, and their reactions which comprise the story of this book. 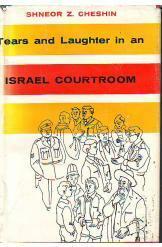 It is an amusing and sad story and is always concerned about the future of law and justice in Israel. 374 pages.